Big Waterways Clean Up 2012 is a London 2012 inspired, partnership campaign run by Thames 21 to improve the East London’s waterways by July 2012. We want to connect East Londoners to their rivers and canals as safe and fun places for people and wildlife well into the future. Thames 21 want to connect East Londoners to their rivers and canals as safe and fun places for people and wildlife well into the future. 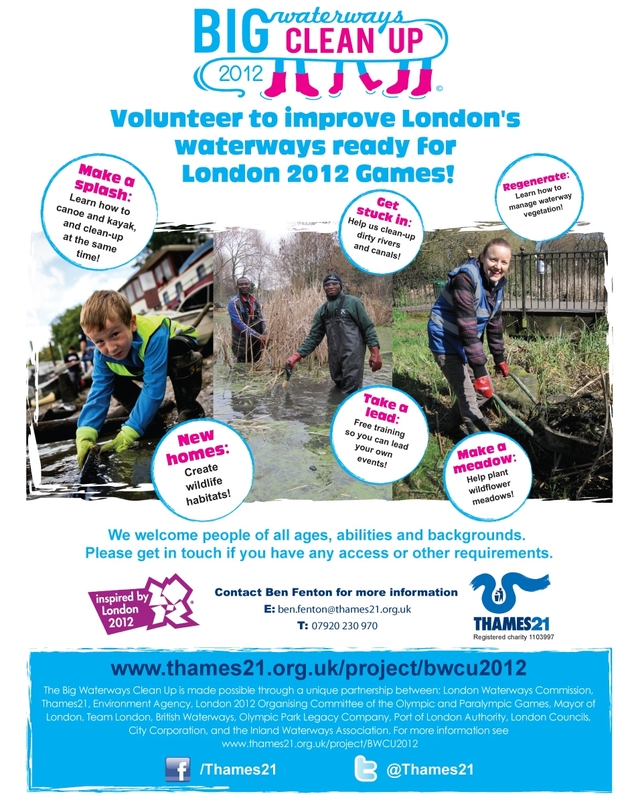 BWCU2012 is seeking young and old to get involved in this mass volunteer-led initiative to inspire community activity and produce a lasting legacy for Londoners and their local neighbourhoods long after the 2012 Games. This is an opportunity to ensure these valuable spaces, which characterise the London 2012 locations, are seen as places we love, respect and enjoy, highlighting London’s commitment to sustainability and social inclusion. And to make sure that your hard work is recognised into the future, individuals and community groups will be offered free training, allowing you to deliver your own waterway improvement volunteer events. Find an event that suits you!